Masses of research has been done into school acoustics, and with good reason. Studies continually show us that school environments without acoustic panelling and poor sound affects both students and teachers alike. A Heriot-Watt University study found that in extreme cases, 70% of consonants spoken by teachers cannot be heard by students. Additionally, INQA provide a study of 1,200 teachers that shows over 80% believe that noise generated by students imposes a significant strain on their teaching and that Primary school children displayed a deterioration in performance of up to 25% when the memory task was accompanied by background noises. These numbers are startling, and demonstrate just how important a healthy acoustic environment is to facilitating healthy learning. A classroom with poor acoustics means poor speech intelligibility; meaning students aren't given the full opportunity to comprehend and absorb information. Acoustic treatments are a simple way to help create a healthy learning environment. Sports halls are often extremely reverberant - owing to high ceilings and hard surfaces; often making communication difficult. 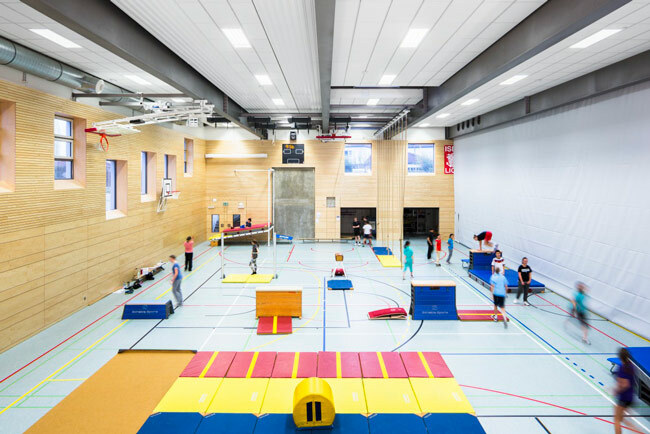 Sports hall acoustic solutions offer supreme sound absorption as well as impact resistance. Circulation spaces and hallways are where students congregate and can become very noisy quickly. This means reception areas and other administrative spaces in hallways can become clamorous and uncomfortable. 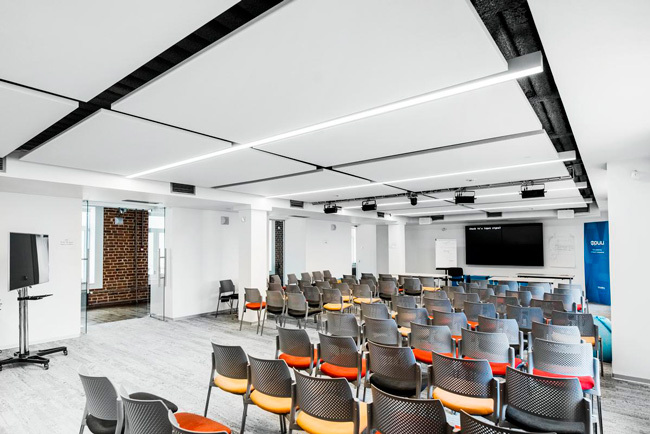 Our acoustic solutions restore comfort for users in these spaces. 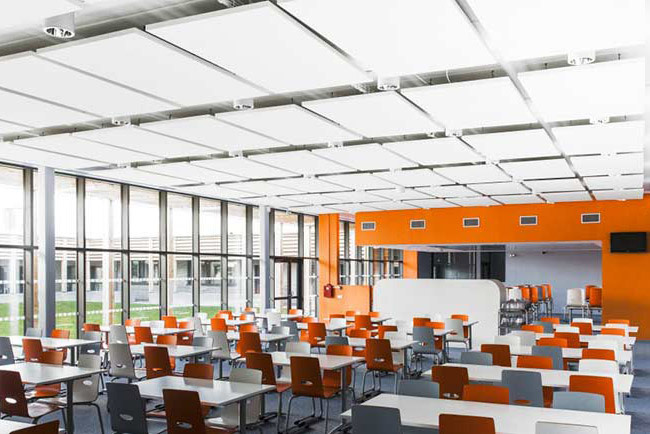 The Building Bulletin 93 (BB93) is the definitive guide for acoustic design of schools. The guidelines are self-described as representing a “significant tightening of the regulation of acoustic designs in schools, to reflect…that teaching and learning are acoustically demanding activities”. Introduced in 2003, Adherence to BB93 Regulations is mandatory in the design of new school spaces. Noise is considered harmful when it reaches a decibel level of 70 and above. The Acoustical society of America’s guidelines recommend that in classrooms, target speech and environmental noise combined, should not reach above 70 decibels. Without acoustic consideration, the ambient noises level in school environments can disrupt the learning process. This is because signal (speech) is often drowned out by high levels of ambient noise. It is recommended that speech should be at least 15 dB loudeer than ambient noise if a good speech intelligibility index is to be met. If a classroom has ambient noise levels of 45dB, a teacher would have to raise their voice to 65dB to be properly heard – straining the voice. The raising of the voice compounds high ambient noise levels in the room and can create uncomfortable environments harmful to the learning process. Healthy education needs effective communication; effective communication requires a quiet environment. It’s simple enough, yet with studies revealing that up to 70% of consonants spoke by teachers go unheard, something isn’t adding up; and the majority of the time it’s a lack of sound absorption that is posing an impediment to student learning and development. Without absorptive materials, sound bounces off hard surfaces, prolonging reverberation time and affecting speech intelligibility. Below is a table outlining the ideal reverberation time for various school rooms.